The Scarlett Rose Garden: Welcome to our humble home! It's high time I've invited you to our home! I've always loved old houses. I've stalked my share, only to be let down when we couldn't get them. Pickins' were getting slim 4 1/2 years ago, and when our realtor friend showed me this one I jumped at it. Only trouble was, it had been quite "modernized". All of the orginal interior trim was gone except for around the front door. The 10 ft. ceilings had been lowered to 8 ft. They were sitting on top of the windows; there wasn't even room for trim! A set of pocket doors led from the parlor to the living room. However, there was an enormous entertainment center built in the living room in front of the doors! The entrance to the dining room from the living room had very wide trim, and I could tell there were pocket doors there at one time. Could they still be hidden~ lurking inside the walls? The dining room was half paneled, half unfinished. There was Cookie Monster blue carpet everywhere. The front doors and newel post at the stairs were painted blue as well. All in all, the house had great bones. Not a victorian painted lady, but a sweet old lady who needed some tender love and a face lift indeed. My mom was with me and she said, "I can see you living in this house." And I replied, "So can I." So we bought it. Kevin had been traveling at the time and I had to spend the first week in the house by myself. I kept wondering if it was haunted, but so far so good! 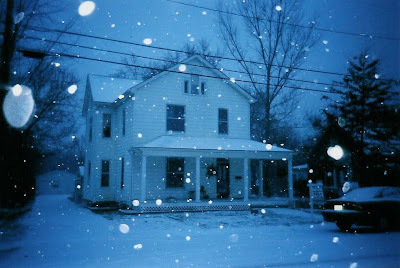 This was the first snowfall in our new home. I used this for Christmas cards that year. We began making changes, and it wasn't long before we learned I was pregnant. Well! That meant a nursery was in store! The work on the other rooms came to a halt as our "storage room" took center stage. Frankly that's how it's been since Nova was born. 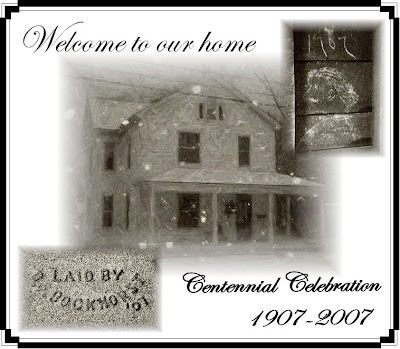 We had hoped to be much further along last year, as we celebrated our home's Centennial. We are just now getting back to the point where we have time and money to put back into home projects. We're doing a very big one next week, so stay tuned! Can't wait to see how it all turns out! I just love old homes! I've gone backward through your blog to read from the beginning, and I'm thoroughly enjoying it so far! The house is gorgeous and I love the name you chose for your son! It's so different!